Let's Take A Quick Look At These Business Infographic Elements! This is a set of popular 150+ business infographic elements, templates & vector kits to design your own infographic. 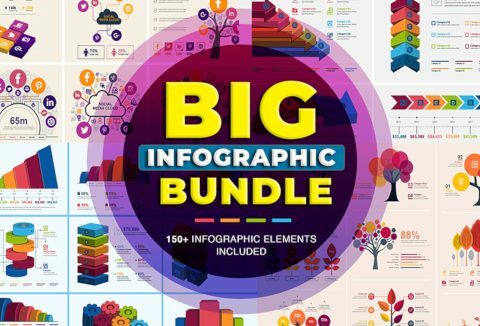 All infographic bundles contain AI CS5 and EPS CS5 vector files. These are fully editable vector files saved as EPS and AI CS5. It includes 4 different handmade colour variation. The colour scheme used is of a Modern and Fresh type. The colour scheme can be changed to anything to match your design preference. You can rescale these vector files to any size. Free fonts are used in this bundle (download links are included in download). These files work best with Adobe Illustrator CS5 or newer. Hiring a freelancer to create infographics might cost $10000+ dollars. Now make lots of individual infographics from this one pack. You should have no problems editing these vector files. And if you're a freelancer - better save your time and money! Promotional email or any other way which you want. Grab these best infographic elements bundle to get your design projects ready in minutes. Cannot be sub-licensed, resold, shared, transferred, or otherwise redistributed on its own or upload to any online & offline database. Create a wonderful customer experience using these stunning business infographic elements. At A Deal Price Of $24 Only!